Whiskey is not the only home-produced spirit enjoying a revival. Gin, once seen as the preserve of the middle-aged yachting classes, is now the fashionable drink around town. Served in teacups or in cocktails, as a classic G&T, or simply by itself with ice, gin overtook vodka in the style stakes several years ago and looks set to become even more popular in 2016. At one stage we were content to choose from a few large well-known brands, but the new gin drinker is much more demanding. Following on from a group of entrepreneurial artisan producers in the UK, Spain and the US, new small-batch craft distillers are springing up all over this country. The process of making gin is quicker than whiskey; no long-ageing in barrels or intricate blending of different casks is needed. Gin is all about the botanicals. It must contain juniper; after that it is up to the master blender to come up with a concoction of herbs, spices and fruits that put a unique stamp on his or her gin. One distillery offers seasonal gins reflecting the changing weather. Some use herbs, flowers and other ingredients foraged locally. You can make your own “bathtub” gin simply by soaking juniper berries, followed by whatever botanicals you fancy, in a neutral spirit such as vodka, although the result is never as good as a high quality gin. Still, you can now try your hand at making gin in Lillie’s Laboratory in Lillie’s Bordello in Dublin. Last year, Desmond Payne of London gin producer Beefeater toured the country with his array of gins. I missed the tasting but have been working my way through the leftovers, so to speak. The delicious Beefeater 24 includes Chinese green tea and Japanese sencha tea in its makeup. Otherwise, Tanqueray No 10 is my favourite foreign gin at the moment, but there are plenty of good artisan producers in the UK. Craft gin production has taken off here in the past 18 months. I looked at the Shortcross, Dingle and Blackwater No 5 gins in 2015; all three are very good. This time, three more Irish small-batch producers. Look out also for the award-winning Blackwater Thin Gin, based on Irish botanicals. Glendalough Distillery make four seasonal gins each year, from wild botanicals, berries and fruit selected by local forager Geraldine Kavanagh. “We have turned consistency on it’s head,” says Gary McLoughlin of Glendalough. “You are literally tasting what is in season.” Less than 2,000 bottles of each batch is made. “They got him on milk and alcohol,” as Dr. Feelgood used to sing. 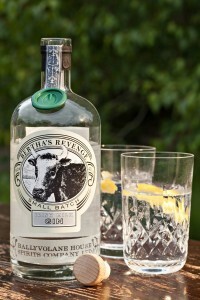 Bertha’s Revenge is a gin distilled from cow’s whey. Bertha was the oldest cow in the world when she died in 1993, at the age of 48. The gin is the brainchild of Antony Jackson and Justin Green of Ballyvolane House in Castlelyons, Co Cork. As well as several ciders, Highbank Orchards, run by Julie and Rod Calder-Potts, make a range of excellent organic apple-based products including two gins. I feature the Crystal below; the other is Pink Flamingo. A lovely lifted aromatic nose, and a smooth warming lightly spicy palate. Complex and delectable. Pine trees, damsons and spice. Very distinctive. Christmas in a glass! 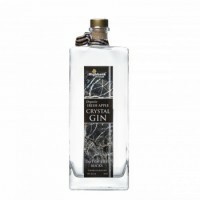 A delicious fragrant gin with subtle apple, juniper and herbs finishing dry and long. Very fine.